In this hybrid cloud world, we’re not all moving to the cloud at the same pace. Citrix enables you to design the kind of cloud-ready IT environment that works best for the business needs of your healthcare entity so that users can access more and more different types of applications—including SaaS, web apps or traditional Windows apps. Citrix solutions help you manage growth and change. Maybe it’s moving from a monolithic hospital-based model to a distributed community-based care program, or maybe it’s a different challenge. Safeguard your IT environment with security that includes artificial intelligence and machine learning to detect anomalies in user behavior, outside threats or problems with endpoints. With Citrix networking, be ready for any challenge – whether it’s scaling to manage an M&A or handling variations in network traffic due to a compelling business event. Citrix Workspace provides secure purpose-built platform for app and data access regardless of device, network or location. Citrix Workspace enables IT to rest easy in the knowledge that data is secure in the data center, and gives them the satisfaction of knowing that clinicians get the same secure and familiar experience as they roam from place to place. 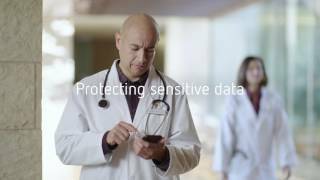 Citrix solutions improve clinical workflows by enabling clinicians to access sensitive patient information on any mobile device, over any network. Apps and data securely follow healthcare staff members as they roam, while clinicians can reduce clicks and unnecessary relaunches of apps as they move from location to location. Have the information for HIPAA and HITECH compliance at your fingertips. Meet audit requirements by enforcing policies that not only grant access to Protected Health Information (PHI) based on the context of the user, but also, that create an audit trail. To assist IT teams for both active compliance incidents and investigations after the fact, Citrix solutions include built-in tools for monitoring, logging and reporting. With Citrix solutions, data is stored in the data center rather than on endpoint devices. This keeps Protected Health Information (PHI), clinical trial data, and patient financial information secure. Citrix networking reduces the attack surface by consolidating access points with granular access control policies, including support for nFactor authentication to assist with PHI compliance. 100% of the top 10 largest healthcare organizations in the United States use Citrix IT solutions. With our current environment, we can deliver our EMR system, dictation software, imaging viewers and more to thousands of clinicians and staff wherever they are. We can remotely wipe mobile devices if they’re lost or stolen. And best of all, the whole thing is entirely seamless to our end users. Most of them don’t know how it happens – they just know that it works.